I was 13 when it occurred to me that I might one day go bald. It wasn’t, though, until I was 26 that I began to realize my fears were coming true. Slowly, but inexorably, I was losing my hair — one of my most dreaded horrors, up there with death, roaches and a nuclear holocaust, was becoming a reality. Like death, I always held a secret, childish dream that a cure for balding would be found in my lifetime, but alas, no dice. I was standing in my ex-girlfriend’s apartment, staring at my reflection in the mirror, eyes burrowing into my (then) barely noticeably thinning hairline. Under her guiding logic, I went to CVS and bought a bottle of Rogaine for $30. I figured she was right: It might be wiser to use topical hormones, rather than devouring them. Back in the bathroom, I took the canned product, sprayed a dollop of the white minoxidil foam onto my hand and ran it along my scalp. It didn’t take long before my reality felt a sudden shift. A dull, harsh headache began to form, and I got into bed and tried to fall asleep. The next morning, it felt like my brain had smoked a pack of cigarettes. Was this a side effect? Did I put too much on? I was sure I was following the product’s directions. Immediately, I suspended usage. Time passed, and so did more hair. I did research on Rogaine, and learned some interesting facts. For example, there haven’t been any tests on the product’s side effects that lasted longer than six weeks. Even stranger was the way the active ingredient, minoxidil, was discovered: Initially, it was tested on mice to help with hypertension, but then it was uncovered that one of the random side effects of the chemical was hair growth. Even to this day, the mechanism by which minoxidil promotes hair growth isn’t fully understood. I spoke to a few dermatologists about the product, and all of them said the same thing — it was perfectly safe to use. Of course, my friends muttered darkly of conspiracy theories that the doctors were bribed to say as such, and that I was essentially putting cancer on my head. Still unconvinced either way, I noticed there was a toll-free number on the label of the can, so I called it and spoke to one of the company’s representatives. I asked questions, but the rep wasn’t much help, giving me the vague, unguaranteed answers I already knew, and asked if I wanted an ongoing subscription. I hung up, went home and tried the stuff again, this time in smaller doses. The side effects came again, but not as strong: My scalp was throbbing, and I had a slight headache. I laid down in bed with the covers over me and stared at the shadows on my ceiling. At the time, I was already using hair restorative shampoos like Bosley, and organic biotin vitamin supplements, but they weren’t hitting the spot. I wanted to do something preemptive, before it was too late. I considered myself a handsome fellow and yearned to preserve my youthful appearance. I was — what’s the word… oh yeah: Insecure. I wanted to remain attractive! Every time I imagined myself without hair, I didn’t like the picture I saw. So I sucked it up and kept trying. According to the mini-booklet that came in the box, it takes 90 days to notice any hair regrowth from Rogaine. It is, they claim, not effective for every user, but for most. Moreover, the product isn’t meant for frontal-lobe balding, but the crown of the scalp, and the back of the head. My balding was mainly frontal, but I read on Amazon reviews that some people were having success in that region, so I decided to take my chances. I used the product religiously, with the full, brutal knowledge that if I didn’t want to go bald, I could never, ever stop. Because from everything I read, and the YouTube reviews I watched, it had shown that all progress would be lost within three months of suspended use. Some even theorized that hair loss would be accelerated. After several months, I noticed my hair begin to fill in a bit, but it didn’t look quite right. It didn’t seem to grow naturally: Weirder, hair on other parts of my body began to sprout longer and thicker, namely on my arms. I noticed my emotions began to change, too. I had mood swings, and was much quicker to anger. I wasn’t sure if it had to do with the hormonal changes in my body from the product, or life events, but nevertheless, I kept using. To my surprise — though it shouldn’t have been a revelation — I found that I wasn’t the only one in the Rogaine Club. “Don’t be fooled by my hair,” I joked with a friend over bottles of Pacifico. “It’s a Rogaine-fueled hologram.” My pal sipped his beer, then smirked. “It’s a good product. I use it,” he shrugged. Having felt alone and kind of embarrassed for so long, I was floored, but after consulting several buddies and pharmacists, I discovered that a lot of men and women are using the stuff. It’s a silent club, which makes sense: Who wants to publicly brag about losing their hair? Six years have now passed since I began using Rogaine. Today, I’m not bald. I’m certainly passably hirsute, although the wavy, seemingly limitless hair of my early 20s is long gone. With the aid of the product, I still grow hair on the front of my scalp, but it looks off — the hair on the sides of my head grows far faster, so I have to get the sides trimmed regularly, otherwise it’s mismatched and I look, as a friend describes it, like a clown whose make-up washed off. Or, as my fiancée illustrates, like I’m wearing a toilet seat made of hair around my head. 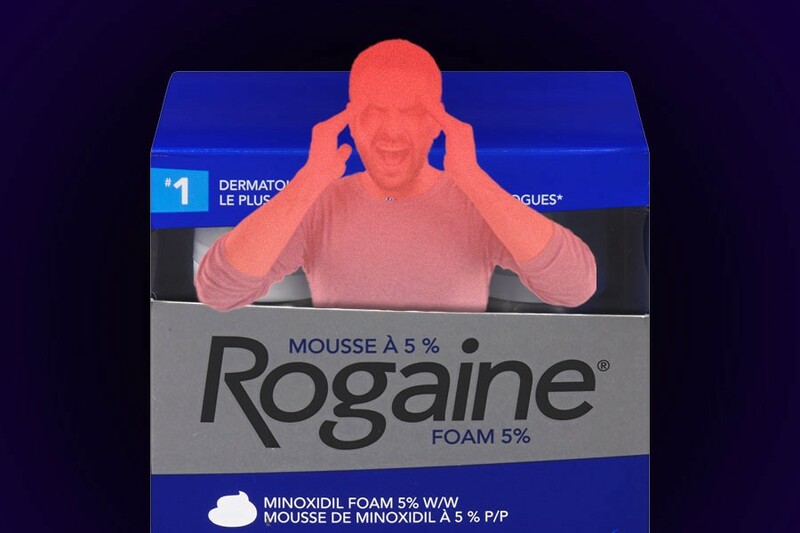 I’m sad to report that I still feel the side effects from Rogaine, too, so I use it about once a day, although it’s directed to use twice daily. I still have mood swings, slight headaches, unwanted hair growth and have an odd, tingly, burning sensation on my hands when I leave it there for a few seconds too long. Worse, the product loses its potency over the years, so I’ve begun to look into other alternatives. There’s a part of me that thinks, maybe I should just let this go? Stop using and go bald. It’s time to embrace what I’m meant to look like, because confidence is the sexiest attribute of all! I mean, it’s just hair, right? It probably goes without saying that I’ll never, ever do this. In fact, I’m willing to use any drug to keep my hair — my priority isn’t so much embracing my age as it is finding ever-harder over-the-counter narcotics to wage my war against my own genetic heritage. I will prevail. And so will my hair.